Housed in the same packaging as Filmstar Bronze and Glow, this new cheek duo can't help but please the eye. Inside the lid is a mirror and then in the case itself are two pans with the bronzer on one side and the blush on the other. 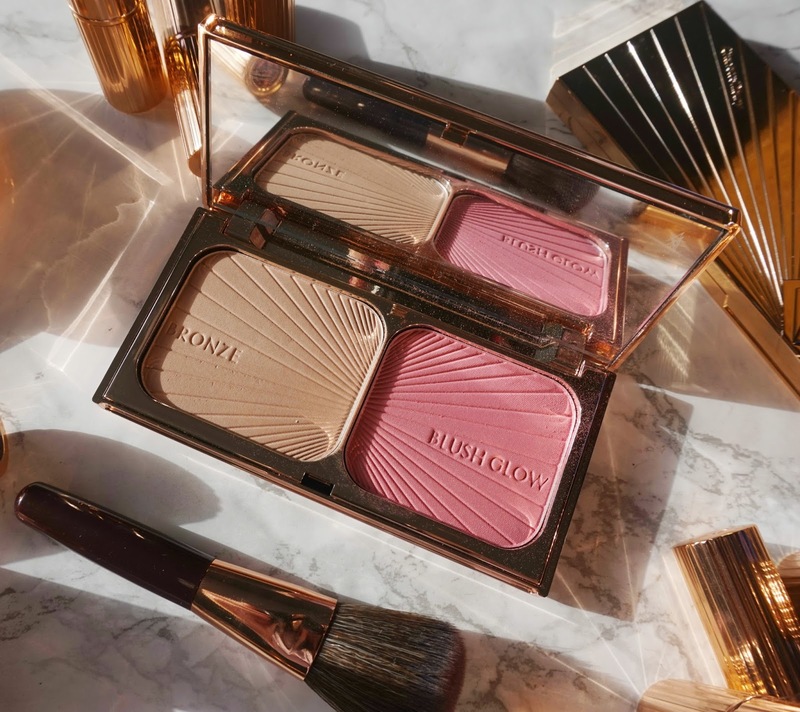 Unlike the Bronze and Glow palette, Bronze and Blush comes with a mini blush brush, which is a nice addition, however it does mean the price is higher at £60 as opposed to £49. The blush appears to be a very bright pink in the pan, however when swatched and applied, you can see that it actually has a hint of coral running through it and whilst it isn't shimmery, it does add some glow. The description states that it contains finely crushed pearls, which add some luminosity to the cheeks. It's the shade of blush that I always gravitate towards as pinky-corals suit my medium skin tone best. I have two other blushes from Charlotte Tilbury and I adore the soft, finely milled texture because it makes them so easy to work with. The blush in this cheek duo has the same soft and smooth texture and it doesn't highlight any visible pores in the cheek area or texture. I find that it is best to use a light hand when applying it and then adding more to build it up, as required. In terms of wear time, the longest that I have worn it is 9 hours and it was still visible on my cheeks when I was removing my makeup. Like the blush, the bronzer is very soft and smooth to touch and a dream to apply. It has warmth to it but it doesn't look too orange and neither is it ashy. It adds warmth to my face and some gentle definition but you couldn't achieve Kim K-W style contouring with this - gentle definition is much more flattering, in my opinion! The combination of the two products add radiance to my cheeks without any glitter or being too o.t.t. - the result is a healthy, youthful glow. 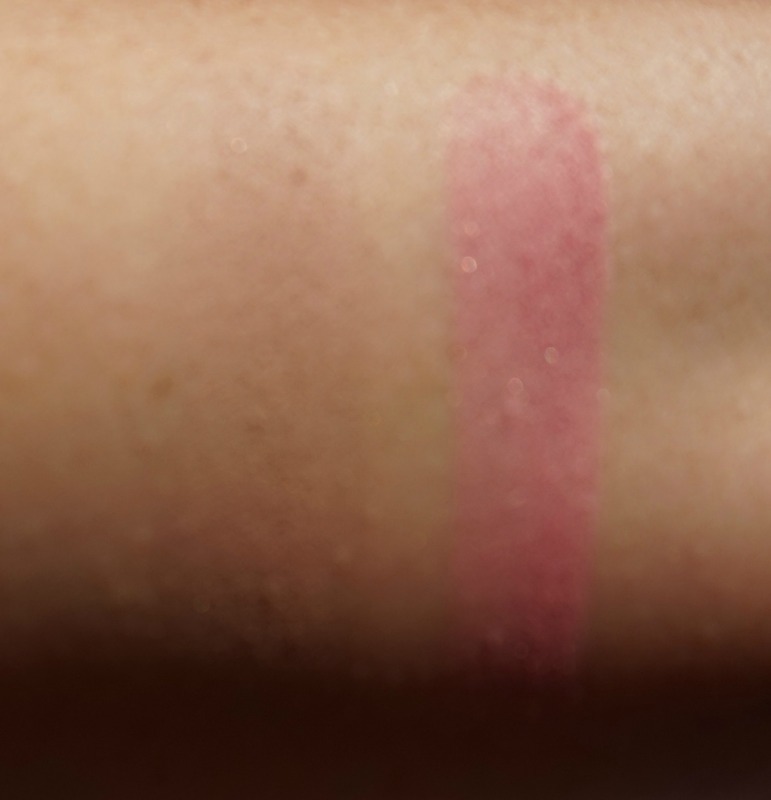 I am hoping that more shades will be released in the future because I know that there are Light-Medium and Medium-Dark options with Bronze and Glow so it makes sense that a Medium-Dark option will be added and, hopefully, more blush options because pinky-coral isn't to everybody's taste. I would also love to see a cheek trio released with a bronzer/blush and highlight because it would be ideal for taking on holiday or for in your handbag, rather than bringing a couple of products. Overall, this is a must have for any Charlotte Tilbury fan and if you have yet to explore the brand, this would be a great place to start! I would love to hear your thoughts on this cheek duo? Are you happy to pay a bit extra to have a brush? Do the shades appeal to you? Now on to the giveaway! The rules are simple. There are 4 mandatory steps - all of which are detailed in the Rafflecopter widget below. You must follow Beautylymin on Bloglovin, Twitter and Instagram and you must tweet the giveaway link. All of the links are in the Rafflecopter widget. If you leave any section empty or with NA, your entry will be deleted and if you follow/unfollow, your entry will be deleted. 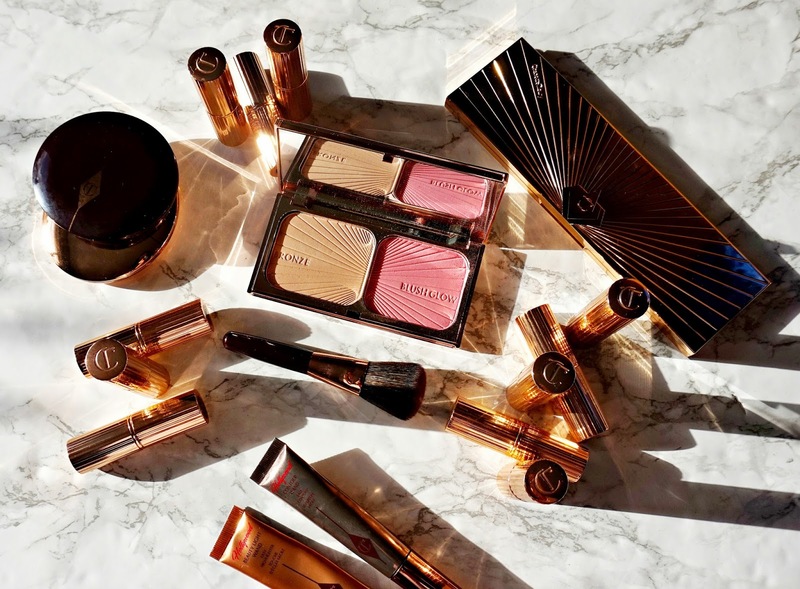 There are a number of ways to earn extra entries: love this post on Bloglovin, comment on this post telling me what your favourite Charlotte Tilbury product is, leave a relevant comment on any other blog post, like and comment on the Instagram photo and tag two friends on the Instagram photo (this option can be done daily). These are optional but all are worth five extra entries each. The giveaway will end on February 25th at midnight and the winner will be chosen via random.org. I will then contact the winner who will have 48 hours to respond to my mail. If the winner does not respond within 48 hours, they will be disqualified and another winner will be chosen. If you are under 16, you must ask the permission of your parent/guardian to enter as you will have to disclose your address. This giveaway is open internationally. There is no cash alternative or substitution available. I cannot be held responsible for any customs fees/charges however I will mark the parcel as a gift. All products are bought by me, unless otherwise stated. I received the palette that I reviewed for Christmas and was kindly sent a second, which I decided to do a giveaway with. Charlotte Tilbury is not responsible for this giveaway. Opinion is always my own.